We love to make full length overcoats and trench coats. Because let’s face it, the coat you buy at the store is barely a coat—it just looks like one. The fabric is too lightweight. It hardly covers your neck and it ends a few inches above the knee. 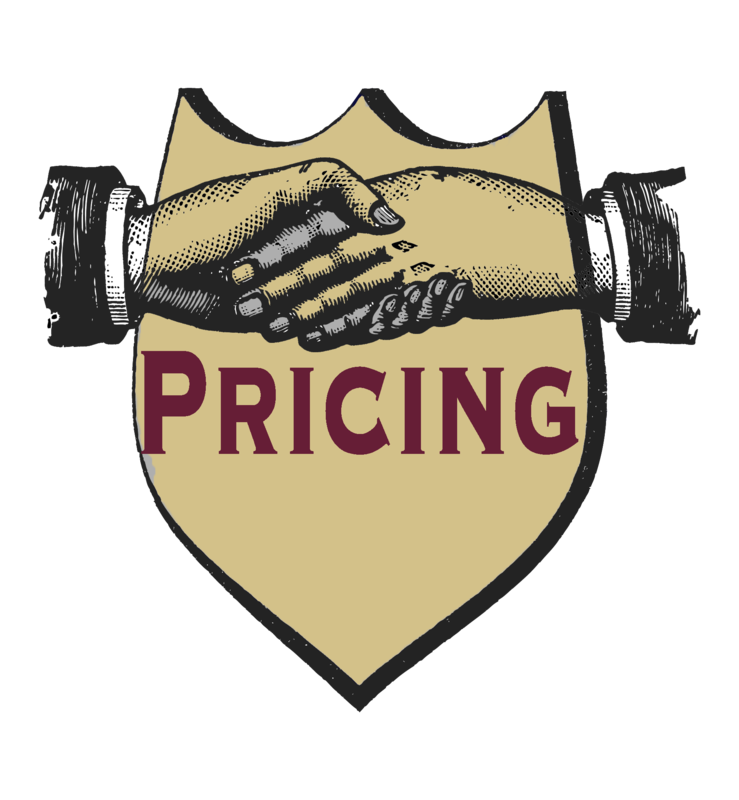 Chances are it weighs less than 1 pound (versus the 5-6 pounds of many vintage overcoats). 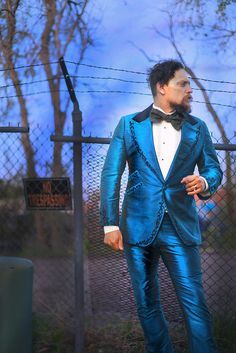 The fabric is probably blended with acrylic and will pill after a few wears. If you want to stay warm or go out in the elements, you will probably end up with some type of ski jacket or nylon puffer. But you can’t wear that with a suit and it is only fashionable on the slopes. Our coats—to say the least—are real coats. The fabrics are heavyweight wool meltons from 23 ounces up to 32 ounces (shockingly warm!) or handwoven Scottish and Irish tweeds that are literally made the same way they were 130 years ago. The lengths and the collars are generous, and everything is intended for a lifetime of wear. 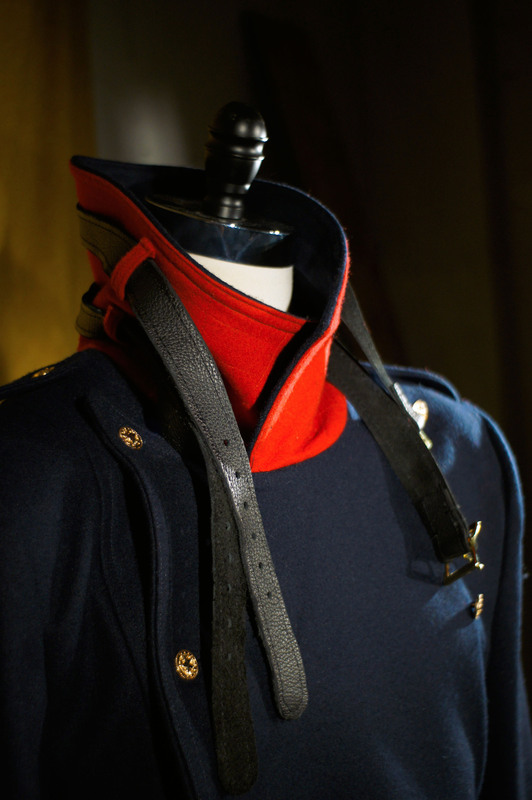 The navy blue coat with the red undercollar is cut from a gorgeous 25 ounce melton with bullhide neck straps. 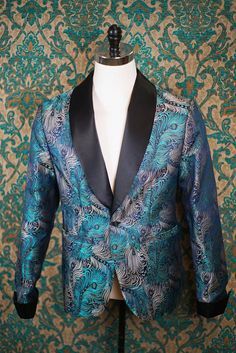 This style is unique in that it features fully convertible peak lapels. This means that the coat lapels can be buttoned all the way up to the shoulder and the top collar can be worn popped up or folded down like a shirt collar. Alternately the lapels can be worn folded with the top collar popped around the neck. The style features a back half belt, a waist seam, and tall seamed on cuffs. 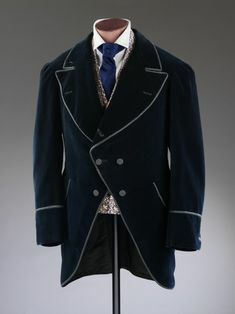 Like all of our coats, this was custom made for a client. 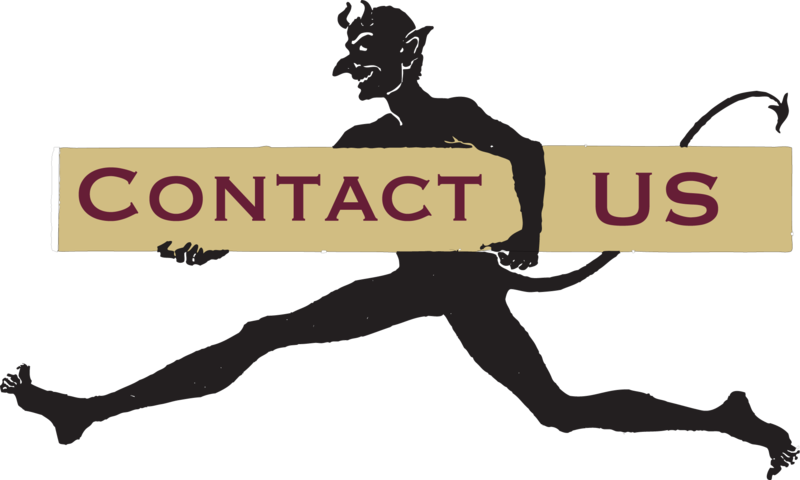 When you contact us, we work to design a coat that includes all of the details and elements that you might like. We can always get hundreds of amazing coating fabrics. 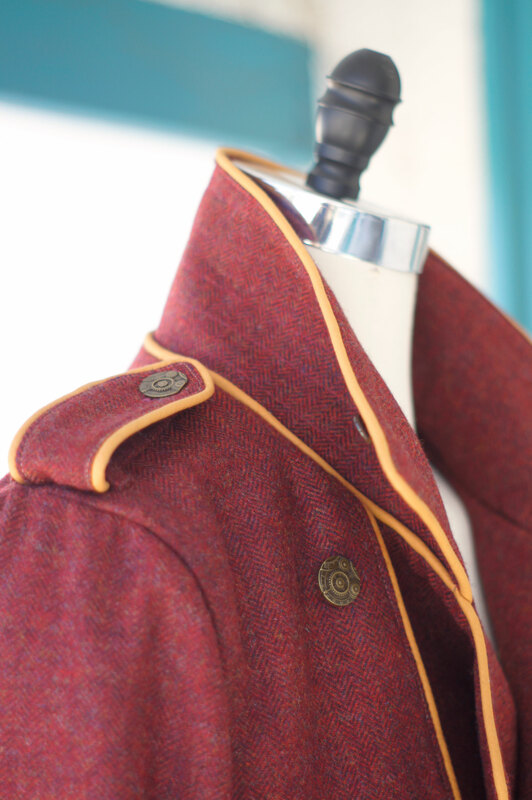 The next set of pictures shows a coat that we made from an amazing handwoven English tweed. 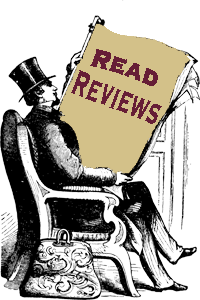 The color is a dusty red interwoven with a deep navy blue. 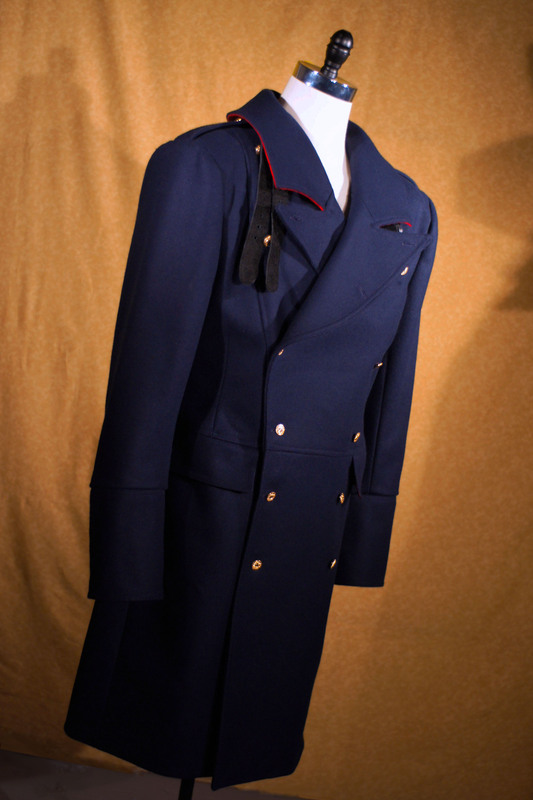 This coat features many of the classic trench coat elements like a gun flap, epaulettes, wrist belts, and a “kidney” to close up the neck. Other elements include top-stitched seams, gold piping on the lapels and belts, and a curved back yoke. 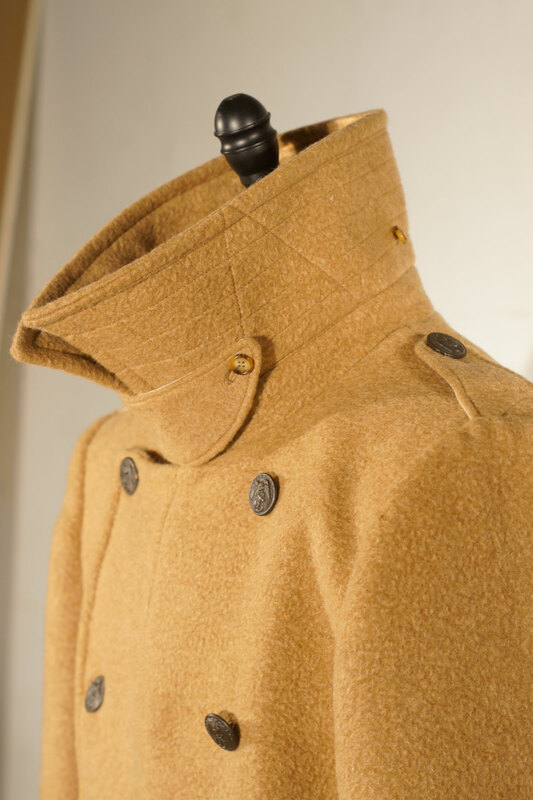 Finally here are a few more takes on the immortal military trench coat collar. The pic of the beige coat shows a coat that we made that is modeled after the M-1912 greatcoat that US Marines wore during WWI. 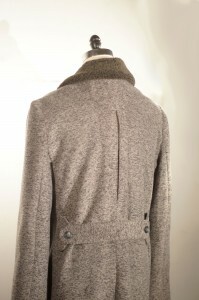 This particular coat is made from an incredibly heavy 32 ounce wool melton with a highly felted nap. 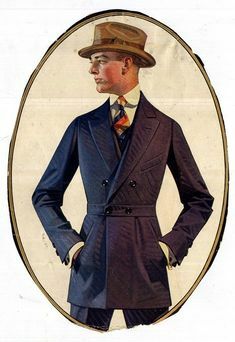 The lapels on this coat don’t fold down quite as much as on later trenchcoats, but the style is meant to be buttoned up all the way to the neck for a distinctly vintage look. 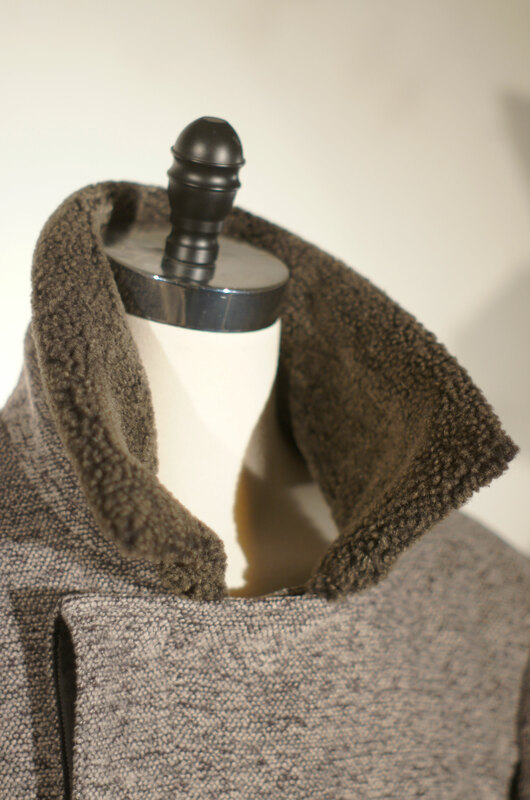 The next set of pics shows a greatcoat that we made with a collar cut from salt and pepper shearling lambskin. 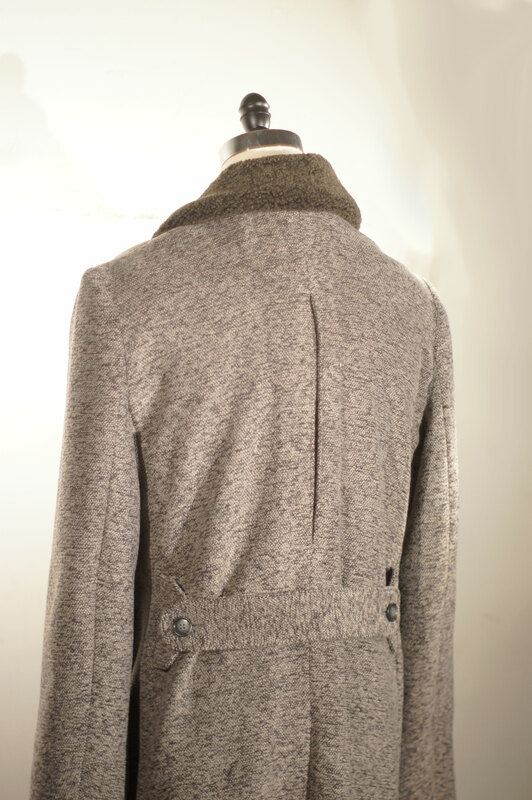 The coat is cut from a gorgeous wool boucle with a concealed front button placket and a back belt that pleats in the waist. 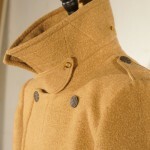 The final pic shows a coat that we made from Navy Doeskin wool with a detachable sheared beaver collar. Doeskin is a gorgeous velvety napped wool that Hainsworth fabrics in the UK is famous for. 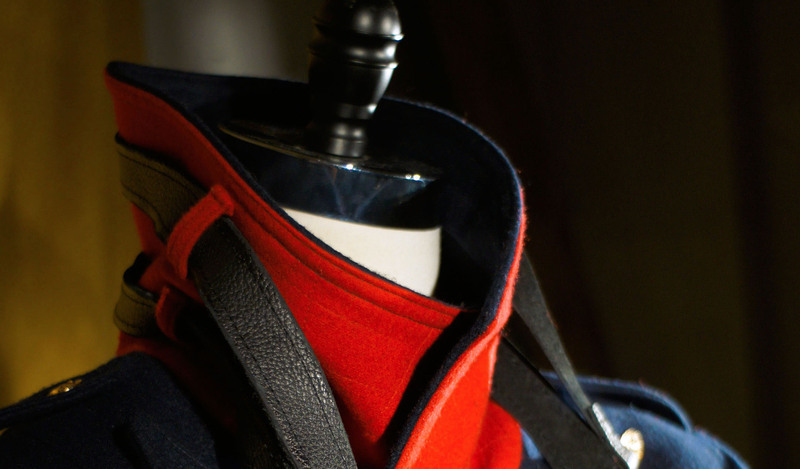 This company, which has been making fabric since the 18th century supplies the fabrics for the Royal Guard and we can supply their fabrics on request. 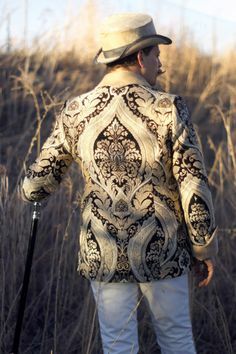 Each coat that we make is totally custom and can be made from pretty much any fabric you can imagine. So if you want a real winter coat that will keep you warm in high fashion, just contact us and we can get started designing a coat for you.